So this crossover thing? Yeah, it's starting to get a little out-of-hand. 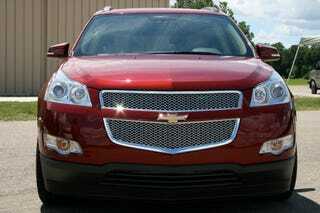 What we have here is the 2009 Chevy Traverse. If you want to use the promotional literature, it's an 8-passenger crossover vehicle. If you use your eyes, it's a minivan with big wheels and no sliding side doors. Thus the stage is set for that epic automotive battle: Marketing vs. reality. Chevy's rationale makes sense: Soccer moms across the country are about to turn in their leased Trailblazers and Yukons. They've seen budgets battered by gas prices, but they still have to have something that can tote the brood around. With 7 or 8 passenger seating, a tall ride height, generous cargo room, and a fairly low load floor, the Traverse attempts to give them a reason to drive back out of the Chevy dealership in something new — something new that isn't a minivan. Chevy needs the Traverse pretty badly, considering they don't have squat between Malibu and Trailblazer. Although Traverse sits on the same Lambda platform upon which the Saturn Outlook, GMC Acadia, and Buick Enclave ride, and it's arguably the least successful styling exercise of the four, perhaps due to the fact Chevy wasn't initially slated to get a Lambda vehicle — it looks hurried. The exterior stylists described their goal as creating a crossover with broad, global appeal. Translated, that means, "we tried to please everyone." As is typically the case when you set out to offend no one, you end up exciting no one. That's definitely the case here. Traverse looks as long as a school bus, and the front end comes off as heavy, with a cow-catcher sized air dam begging to scrape the nearest curb. Inside, Traverse mimics Chevy's successful Malibu with a sweeping dual-cove theme for the dash and materials featuring good texture and a solid feel. Available SmartSlide seating for the middle row causes the captain's chairs to glide forward with the pull of a lever, allowing good access to the surprisingly comfortable third row seats. But the lack of a sliding side door means piling tweeners in and out without bashing into the cars beside you will never be as easy as it is with a van. On the road course GM set out for us, Traverse displays the good manners we've come to expect from the Lambda platform. It has decent acceleration for its size, good isolation from road, wind, and engine noise, and corners pretty flatly give the size and weight. The stability control system does an admirable job of avoiding cones in wet and dry conditions, and it handles Michigan-style bumps and potholes with aplomb. But, since GM is touting the Chevy's towing ability (5,800 lbs. ), it was surprising to feel how much the Traverse was affected while pulling a 4,000-lb boat/trailer combo. The tail felt unstable at moderate speeds, and there was never any doubt about the chunk of weight on the aft end. So where does this leave the Chevy Traverse? Chances are it'll sell well, considering there are still folks out there who won't drive anything but a Chevy, and the fact the Traverse is light-years better than the Uplander and Trailblazer. Chevy's pricing is going to be key: If it's in the same ballpark as the Outlook, we'd guess GM aficionados will be rethinking Saturn or upgrading to an Acadia. Most of the other buyers will be across town scoping out the Ford Flex.